On Thursday, January 16, 2019, the Miramar City Commission passed a measure to waives water bill late fees and prohibit water services from being disconnected for federal employees not being paid during the partial government shutdown. The partial government shutdown began on December 22, 2018, after President Donald Trump’s request for a $5 billion wall along the US-Mexico border was denied by Democratic politicians. Now on its 28thday, this has been the longest government shutdown in U.S. History. Gilling encourages Miramar residents to register to vote with the Broward County Supervisor of Elections on their website at www.browardsoe.orgor call (954) 357-7050. 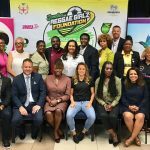 Special Recognition For Reggae Girl Nicole Mcclure At Bickle 25 Launch!